IML, is the province’s newest resort that rises at a peak in Lumasal village. IML (short for Irineo Miguel Lopez) Ecopark is an old hacienda now owned by former Mayor Aniceto Lopez Jr. and family. “I remember, as government troops were running after the rebels that day in August 2008, I was busy planting bananas here,” Haydee Lopez said. She purchased the old Hacienda Ong for her banana plantation while being assured of her husband’s consent despite the odds. Her husband, the visionary town leader, sees where the municipality is heading. The fact is he was able to instill excellent leadership among his constituents for simply being a peace advocate. “This resort will give new meaning to guns and bullets,” the couple had to say. At the resort, the Lopezes plan to construct 25 rooms from P1,500 air-conditioned rooms to economy rooms and a dormitory. These rooms will soon be named with different ammunition accordingly, thereby renaming bullets of death into cozy and convenient rooms to relax and be private. The eco friendly park & resort sits at a 100-meter altitude. Last May, the resort opened the zip line to the public. At the end of the promo day, it accommodated 120 riders -- for free. IML Ecopark is an all-adventure destination, recreation, and a place for vacation. Seated at the 33-hectare banana plantation is a shooting range at the right, a 580-meter long zip line overlooking two swimming pools, one for adults, the other one for kids, a garden, playground, a conference room and private cottages at the left. There is a restaurant, a display center and a park that can accommodate 25 vehicles. A bigger conference hall will also be constructed at the back portion for 300 business guests. The parking lot has five open cottages offering a view of the national highway that strips off the vast coconuts and the seashores. All these are overlooking the Sarangani Bay. 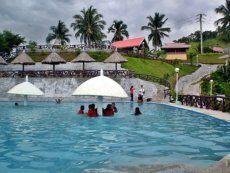 Iniong playground, named after the family’s youngest son, Irineo Miguel, gives a wide view of the two pools. Up there, one can feel and see the sea-breeze busying all day combing the leaves of the vast coconut trees below. The 580-meter zip line crosses the twin pools below the patterned coconut trees and a pond the Lopezes plan to develop soon for boating and fishing. “I was nervous at first but before reaching the finish line, I’d already recovered and enjoyed the thrill,” Shina Marie Batiancila said in excitement. Shina is Miss Malapatan 2009 and had her life’s first zip line ride here. A view of the zip line from the resort gives a fascinating sight of Sarangani Bay Protected Seascape as a background. For walk-in guests, it costs P50 entrance fee to enjoy the exhilarating view and all day swimming in the pool. About 200 meters from the beach are a few artificial reefs. Maintenance staff Mansor Masdok named the reefs as Lobo, Supo, Lunay, Taluk, Katubao, and Kulafu reefs. “For a real diving experience instead, you go to Lemlunay Dive Resort,” Lopez said. “All we do here is to compliment our business partner in this side of Sarangani coastline,” the former mayor said. IML Ecopark, with Lemlunay Dive Resort and South Point Divers, are Maasim’s tourist destinations. At present, there are already six airconditioned rooms good for three persons at P1,500 per room and two P1,000/room good for two. All-Filipino cuisine is offered at the restaurant -- from quickly served short orders to a main menu of sautéed and garnished beef, pork and chicken recipes to desserts and drinks. The restaurant features its Chicken Aloha, a unique chicken adobo bathed in sweet chili sauce and oyster sauce garnished with spring onions and sliced pineapples. But IML Ecopark’s operations manager Bernard Salveron, chef Ariel Perreño and supervisor Arnel Alforque were one in saying their beef, pork, or seafoods sotanghon guisado are still the most requested menu at P150 good for 4 persons. IML Eco Friendly Park has one of the best shooting ranges in the country. Actually, the idea to build a resort started from the father-and-son’s shooting hobby. Two Gov. Migs’ steel challenge competitions have already been held at the firing range. IML has 80, 100, 150, 200, 300, 400 and 1,500 meter shooting ranges at the back of a hill. “Yol”, as the former mayor is known among Maasimians, bragged that the range has a shooting distance that is excellent for sniping practice and also a natural huge buffer that can even handle explosion tests. No wonder Otoy has become an expert rifle marksman. For her part, Haydee, the eco friendly park & resort’s brains, beauty and labor (she being the engineer, the landscaper, the lady mason and the architect of it all) was simply looking for a trucking exit for banana products but found a far better idea! “I made it my motto in life not to wait for tomorrow what you can do today,” Haydee mused. “I can’t wait. The idea is there and I have to grab it,” she added.